I loved the latest inspiration for the Runway Inspired Challenge ric#82 . Elegant. I didn’t bust out any new ideas or techniques, just stayed elegant and classic. 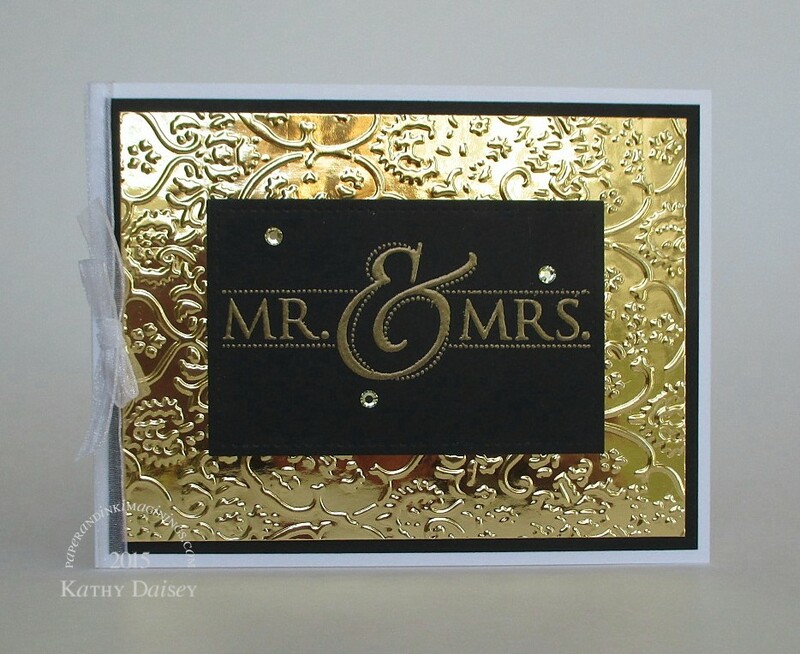 I embossed the gold mirror paper with an embossing folder, and was very happy that the embossing did not crack the paper or the finish. Supplies: Stamp – Stampin’ Up!, paper – Neenah Classic Crest Solar White, Recollections Gold Mirror, Stampin’ Up! Basic Black, ink – VersaFine Smokey Gray, die – Lawn Fawn, embossing folder – Provo Craft, jewels – EK Success Swarovski Elements, embossing powder – Stampin’ Up! Gold Glory, organdy ribbon – JoAnn’s. Categories: anniversary, bridal/wedding, card | Tags: card, EK Success, Lawn Fawn, Neenah, Recollections, Runway Inspired Challenge, Stampin' Up! | Permalink. Thanks, Holly! I didn’t reinvent the wheel, but I have not used gold mirror & black together before.